A TV Commercial director and fellow foodie (Also the only person I know who has actually tried "Butter Beer") I work with, Direk Paolo Dy, visited our new office one day. As I showed him around, I grumbled that I'm going to miss having the restaurants in C. Palanca to choose from. Then he said, "Well at least you're just down the street from " Ukokkei"!". I stared at him blankly, and then he looked at me, all baffled and replied, "You DO know what Ukokkei is, right?". I told him, that I wasn't really into Japanese food, but he would have none of it. As a client, Direk Pao is a joy to work with, because he's one of those laid back directors that is easy to talk to and always seems to be in a good mood. So when he gave me an intense look, and told me in a firm tone, "One of these days we are going. 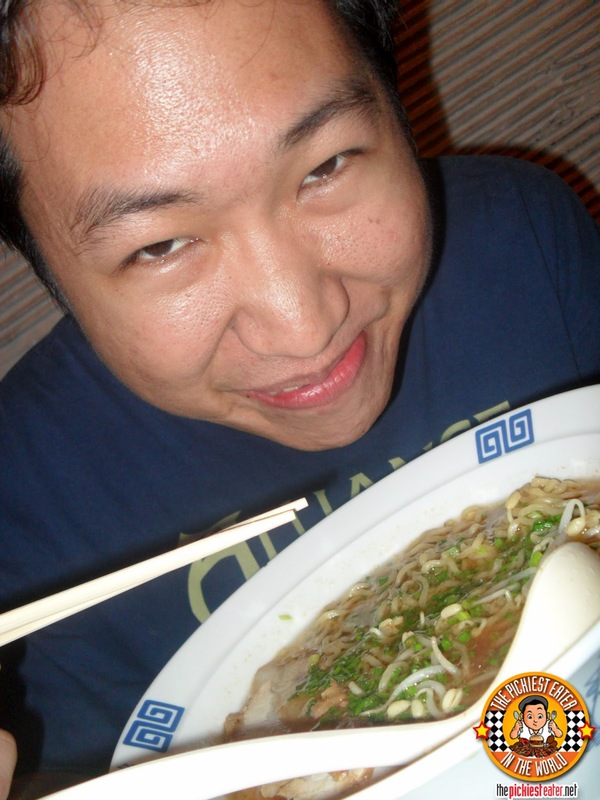 ", I knew I was in the presence of a man who takes his Ramen seriously. A few months later, lo and behold, Direk Pao treated me and some of the PostManila peeps for a job well done on one of his projects. Take one good guess. In my entire life, believe it or not, I've never sat down and ate a bowl of Ramen- as in, JUST Ramen for a meal- so this was going to be a first for me. However, all it took was one spoonful to make me wonder how I could have lived all 34 years of my life without ever eating this bowl of wonder. The service was decent, however, I was a little bit peeved with something they did to us, but lo and behold, it was the work of the man who has been come to be known in the Ramen world as the "Ramen Nazi". We were a party of about twelve, so they gave us two tables. Since the other members of our party came a little bit late, we were at first around seven people. After around 30 minutes or so, the rest of our party hadn't arrived yet, so the waitress asked us to move to one time. I said, that would be fine, however, what will happen when the rest of our party DOES arrive? she offered no other alternative for me, except to say na, "It was what the chef said". So we moved tables, then true to form, when the rest of our party arrived fifteen minutes later, the waitress could not give them a place to sit. The solution? The other members of our group who already got their orders had to speed up their eating and go ahead. I must say though, I was lucky I had Direk Pao with me to walk me through on what to order, because without him, I probably would have asked for a Katsudon or a Chicken Teriyaki (Domo Arigato, Sensei). The menu was a little bit confusing, but they do have some value meals. Instead, by the time I left Ukokkei , I was a "Ramen Connesieur". 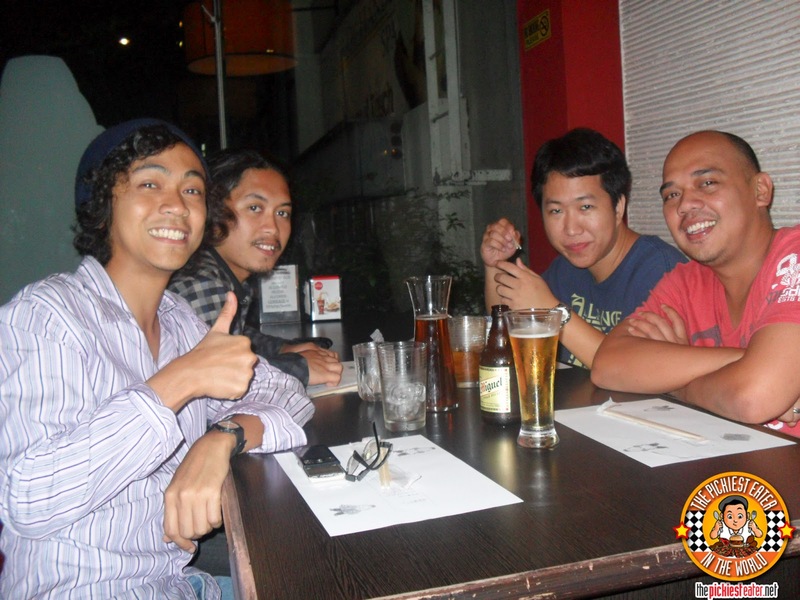 I went back a few weeks later with my cousin Paolo, and another director, Joaquin Valdes of "Tapa D' World" fame. This time, I was armed with Rina's camera (Check out the two hams in the topmost picture of this post).. that was until The Ramen Nazi struck again. First off, I hope I'm not offending anyone (except the chef) with the term, "Ramen Nazi", but believe you me, that's the nicest thing I could think of. I'm sorry to say this, but the guy is a total prick, not unlike the Soup Nazi of "Seinfeld" fame. But I will be the first to admit, he makes some damn good Ramen. He had the waitress come over to my table to ask me to stop taking pictures because the flash hurts his eyes. We we around 15 feet away from the kitchen. Fine, I'm not a hard guy to talk to, so what I did was, I turned off the flash, faced the other way (meaning I had my back to him) and continued to take pictures. Guess what? It still wasn't enough. The waitress came back to me with a look of fear in her eyes, asking that I stop because the chef was getting upset. So I asked the waitress, "So let me get this straight. I'm not allowed to take pictures of my own food that's placed on my table?". All she could say was, "I'm sorry sir, he's getting upset". I have no idea if he has any ninja skills, and my two companions wanted their Tantanmen so badly that they were probably going to pretend they didn't know me in the event that I get thrown out. Thankfully, I had gotten enough pictures of the food (none of the place though) for me to just let it go. 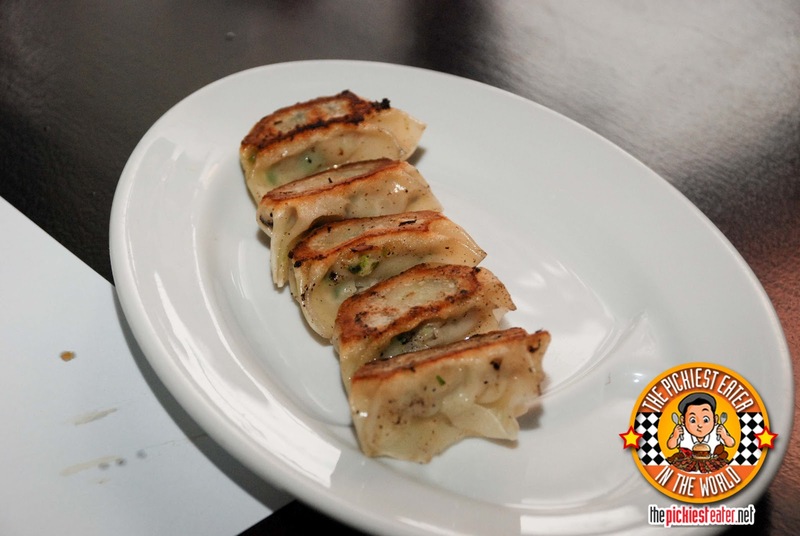 At first I thought that the Gyoza (P120) looked burnt, but when I bit into it, it was done just to my liking. A delicious, meaty dumplying with a crunchy bottom, enveloped in a light wrapper. I realized that If you don't burn the bottom parts of a Gyoza, then it's basically just a dumpling, right? Given my love for pork, Direk Paolo suggested I get the Miso Char Siu (P380), and boy was he right on the money. Thank goodness he suggested when he did, because I was about to order the Shoyo Char Siu, simply because I expected the soup to taste like "Miso Soup", something that i absolutely abhor. He explained that the "Miso" in the Ramen was a bit sweeter than Shoyo, and tasted nothing like Miso Soup. This was probably the best soup based noodle dish i've ever had. I would be hard pressed to find anything better. 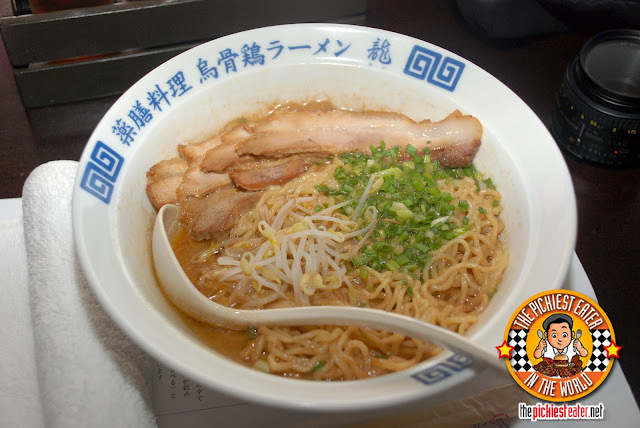 The hand made noodles were firm and cooked perfectly, and the slices of pork were so tender and soft, you'd think that they had actually enjoyed laying in that Ramen bath. Paolo and Direk Joaquin ordered the "Tantanmen" (P380), which is among the specialties of Ukokkei. I haven't tried this myself because I heard it's spicier (but according to Joaquin, "Fattier") than the Miso Ramen, (my tummy can't handle spicy stuff), but I heard it's so good, and for some reason, the Chef only makes Ten Bowls a night. If you get there by around 8pm, there's a very good chance there won't be any left. 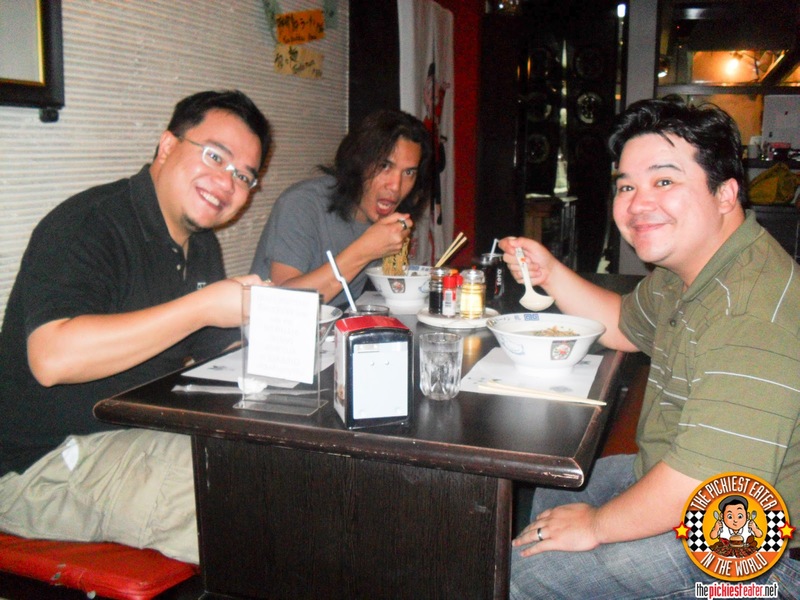 To this very day, my cousin Paolo and Direk Joaqs still get Tantanmen cravings from time to time. Another Ramen of Ukokkei I tried and loved was the Buttered Corn Ramen (Don't remember the price.. I think it's around P330 to P350). It's lighter than the Char Siu because there are only around two pieces of meat, and is instead filled up with corn kernels and a square of butter that melts upon mixing into the bowl. It's awesome, however I still prefer the meatiness of Char Siu. Just so you know, the Ramen Nazi also has a few rules to Ukokkei, the first being a no take out. The chef feels that his dishes should only be enjoyed at the sanctity of Ukokkei. I don't blame him for that either, because if you end up eating it cold, and you don't enjoy it, you might blame the Ramen Nazi. The second is, a strictly "No Sharing" policy. I actually don't mind that rule so much because anyone who tries swiping some of my Ramen could very well lose an appendage. I have no idea what happens if you get caught sharing with our companion. My best guess is that the chef walks out of the kitchen, snatches your bowl away and screams, "NO RAMEN FOR YOU!!" I wonder if I could apply as their new mascot? I think Pao wants to be M. Lhullier's new mascot too! The ramen master at Ukkokei is a regular bad-arse, but you have to admit that he sure knows what he's doing in the kitchen and he doesn't skimp on the quality. If he's like that with his customers, I can't imagine how he treats his Filipino staff (it actually shows thru them, as I've experienced it first hand). I didn't even experience the rudeness in actual ramen houses in Japan. And it really irks me that a ton of reviews about his restaurant focuses on his attitude. There are far better ramen houses here in the metro, imho. I remember watching this Brittany Murphy film aptly named "Ramen GIrl" where she tried to apprentice under a neighborhood ramen nazi. And if I'm not mistaken, there was a part where the master was telling her this important lesson in ramen making: " The spirit of the ramen depends on the chef's emotion" (or something like that, lol!) . No wonder I left agitated. At pwede ba, nasa Pilipinas sya. Huwag syang magsiga-sigaan dito. His store is still in our land. Yun lang. True.. The waitress had genuine fear in her eyes when I was talking pictures.. makes me wonder as well.. Although I did hear that the owner himself (the chef isn't the owner) is a very nice and hospitable man.. maybe he should teach his chef a thing or two about treating customers..
Haha nice! My first negative comment! To be fair, I agree with you.. restaurants SHOULD give up reservations after 15 minutes of waiting.. You said you'd there at 7:00pm, they graciously held it til 7:15pm.. You got there 7:30pm.. Your fault. To me that makes total sense.. but only if the ENTIRE PARTY was a NO-SHOW. remember this.. More than HALF of the group was already there, and we already ORDERED. Its just a part of our group hadn't arrived yet. Plain and simply, they were finding ways to accommodate their other customers, but sadly, at our expense. Ukkokei in the business of service. Part of that service is to assure customer comfort. we were already 7 ppl there. The table could comfortably seat around 6. I was upset not because they had us move tables. I was upset because they refused to offer me an alternative for when my companions arrive. They simply didn't care. A restaurant that actually cares about their customers.. I don't know about u, but I kinda look for that in a restaurant.. Or does a customer expecting that sort of thing too much of an inherent trait of a Pinoy? And Its not like I leaped the Ramen Dude's fence to take pictures of his personal property. I went to his restaurant to pay for what he was selling. Since I paid for it, the ramen dude gave up ownership and all rights to that one specific bowl. That bowl of Ramen was MINE, "intellectual property rights" be damned. If I wanted to take pictures of it, I felt it was my right. There would be a huge difference between taking a picture of a bowl of Ramen that you paid for in their restaurant, and breaking into the Ramen dude's vault to steal his recipes and post it online. Then I agree, I would be in violation of his "Intellectual property". Now if they didn't want me taking pictures IN the restaurant, then that was within their rights. However the waitress INITIALLY told me that it was the FLASH that bothered the chef, not the actual act of taking of pictures.. So as a sign of respect to the chef, I changed angles so the flash wouldn't point at him. But when the fear stricken waitress clarified that the chef didn't want photos taken in the restaurant, I fought my innate pinoyness to make reklamo and just packed up my camera... once again, with respect to him. Yes, I agree with what you said, Anonymous. Please do take my experience with a HUGE grain of salt, in fact, please take EVERY post I write here with a grain of salt because I have no illusions of being a know it all when it comes to food and restaurant service. This was just MY experience in Ukkokei (I've been there thrice, this post was based on two visits, and one incident was uneventful). But you have to understand that's exactly what my blog is.. a venue for me to share with the world my personal experiences. I have heard many stories about the chef that would definitely take him out of the running for the Nobel Peace Prize, but I chose not to post any here because it's not based on my personal experience, thus to me, it's just hearsay. So regardly,to me, the Ramen dude will always be the prick that wouldn't let me take pictures in his restaurant and had my group squish together into one table, despite the fact that more than half of us was already sitting in two just a few minutes earlier (A bit unethical for a restaurant to do if u ask me, but to each his own). But gawd dang, does he make good Ramen. By no means have I any plans of going on a hate campaign against Ukkokei and their chef, because, despite how much I dislike the way he runs the place, the food is spectacular, and I stand by what I said about it being the best bowl of Ramen I've ever had (I haven't had very many though). If someone asked me where to get the best Ramen in Manila,I wouldn't hesitate to say Ukkokei, but that recommendation will ALWAYS come with that little asterisk. If you're ok with all those kinks and believe their treatment of their customers was fair, which based on your comment I'm assuming you are, then by all means, Bon Apetit'! Once again, Thanks for your comment! Great ramen post. I'm afraid of the ramen nazi though so I'll probably stick to the ramen place near where I work for now. As for you being Pinoy, I assure you there could be worse things (hehehe). Like being a Pinoy who says "Mga Pinoy nga naman (insert criticism of Filipinos in general here)" as if you're not Pinoy yourself. **********Typo alert (I get that a lot) "Regardly" was supposed to be "Regardless"
As for me, I discovered Ukkokei back in 2008 when I was pregnant with my son. I used to have MAJOR ramen cravings then, so I'd eat there for lunch almost everyday, all by myself (because none of my relatives would believe me when I'd say just how awesome it is =P). As for my experience, I also always found the chef to be unfriendly. He used to have the waitress sort of pick out which table I could sit in, in an empty restaurant! I used to be his ONLY customer, along with the occasional two or three other Japanese businessmen, until I got my hubby so addicted to ramen as well. So he had a total of five loyal customers then! Haha! But at around 11:30am on weekdays, I was usually his only customer, and nope, the place wouldn't get full by noon either. So I never got why there were restrictions as to where I could sit. Fast forward to present day, when we once brought our son to Ukkokei, the waitress would keep telling us off on what our son can and cant do according to the chef's orders, such as no touching the giant noodle soup fixture, or no sitting on the table. Umm, we're the parents! Leave it to us to restrict our kid from being "malikot." But hey, you can't expect anything less from a toddler. We got kinda pissed off that the chef was telling us what to do so we ended up leaving. I guess it isn't the most kid-friendly place. Thanks for sharing Pat! I guess i'm not the only one who loves the Ramen but has complaints about The Chef being a little bit too O.C. 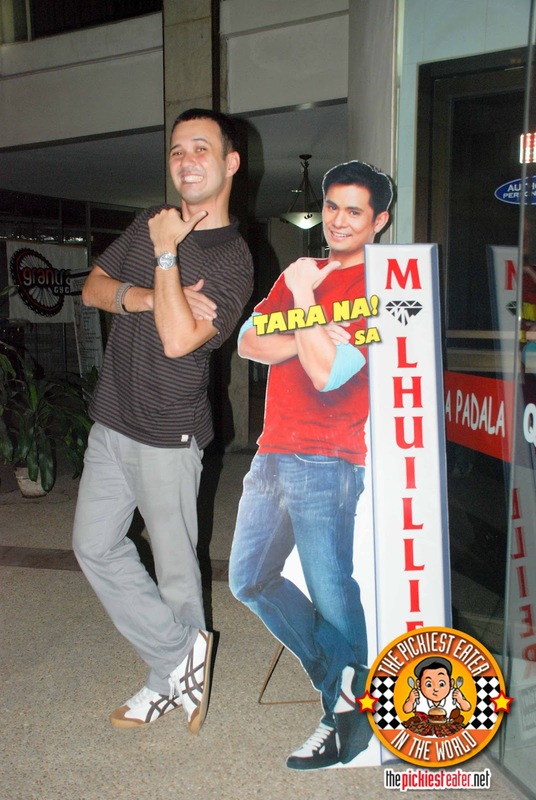 when it comes to the rules of his restaurant hehe.. You must be pinoy too!?! hehe..
Haha! Im definitely Pinoy and proud! 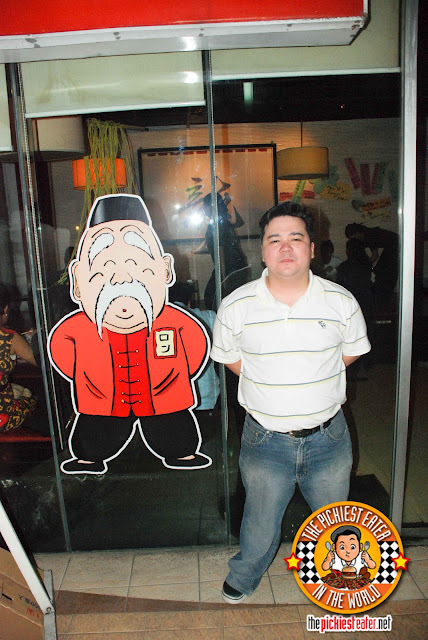 Mr. Nazi Chef's business is booming in our soil, thanks to us Pinoys! OC with his food, OC with his staff and customers. The same thing that makes his ramen great means he'll tend to care more about quality of things than about people's emotions. Steve Jobs was apparently the same way. So, take it or leave it! Tried this place. Not impressed. The ramen place in the same complex as dampa macapagal is better. I think the old name used to be Genya. Will look into it.. Thanks Anonymous! i just had to post something because i truly love ukkokei ramen - and ramen in general! 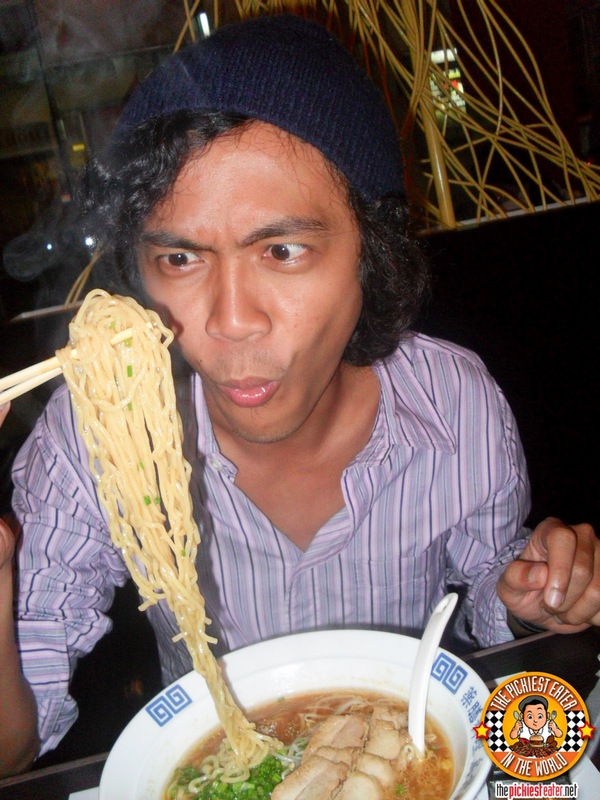 anyway, i look forward to more of your ramen (and food in general) escapades. though for me, ukkokei is my top ramen choice. no offense, but to those who say cant even appreciate that ukkokei is one of the top ramen places in the philippines and that some other place is better, well, maybe their 'better' is my 'worse,' and vice versa. to each his own, i guess! uumm... yeah.. Actually.. um.. I did that on purpose cuz I was just testing you guys to see who would catch it first.. and you passed my test Nicholei! Congratulations!! Hehe.. man I can't believe this post has been here since Aug 2011 and I only noticed it now! Not worth the time. I ate here last year and was so angry about the rude behavior and arrogant service of the staff. Since it was a year ago I decided to come back here. But nothing has changed. The staff was still rude and arrogant. I walked out even before ordering. There are other good ramen places around. So don't waste your time with this one. yikes sorry to hear about your bad experience, Anonymous! I hope they get their act together! That's great to hear, Jehan! Like I said, I hold no grudge with the Chef.. im just glad he didn't make bastos anyone else hehe... 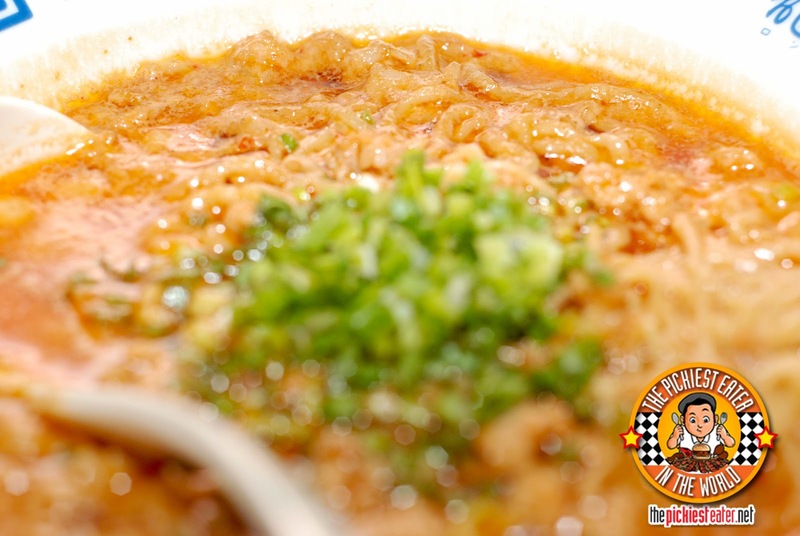 I promise you i WILL go for the Tantanmen during my next visit! where is this resto located?ramen looks good! 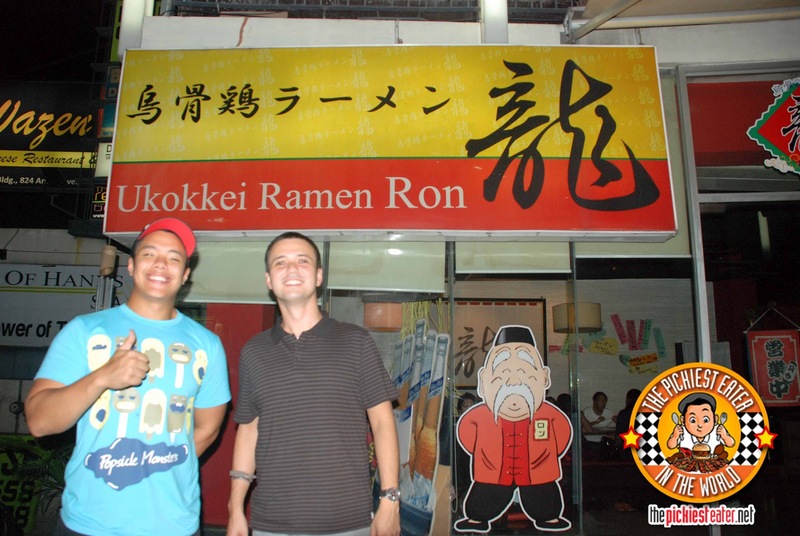 Ukokkei Ramen Ron is in the Makati City or Mckinley Hill in Taguig City.